Very useful walk through Brian, thanks for sharing. hi- can I host multiple awr warehouses one per data center as I see tremendous slowness with close to 1 million awrs from 60 databases! That is a great question. 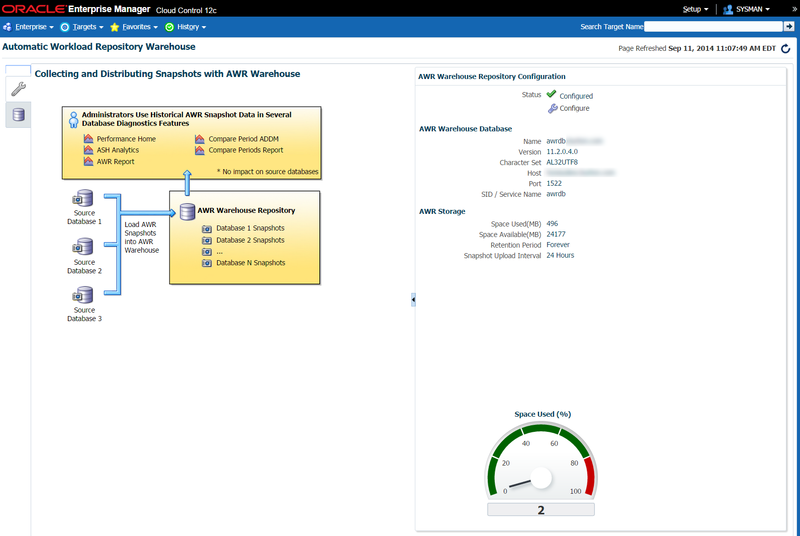 I believe that currently EM12c only allows a single AWR warehouse per OEM environment. If you have performance problems I suggest filing an SR with Oracle so that they can know about issues with a large AWR warehouse or advise you on tuning. Based on a previous blog post from Kellyn Pot’Vin (http://dbakevlar.com/2014/06/awr-warehouse-in-em12c-rel-4/) I think the AWR warehouse should be able to handle huge datasets. Her post shows an AWR warehouse holding 63TB of data from 713 databases. I do not know what kind of hardware she has behind that AWR warehouse, but you may simply need faster drives, more RAM, more CPUs or only some database tuning. I am trying to enable AWR Warehouse on my system ,I recently upgraded to EM Cloud Control version 12.1.0.5.0, I don’t have a GI DB so patch 19051570 will not apply for me. Could you provide any info on where I might need to go from here to get this enabled please? First I have to mention that I have upgraded to OEM 13c, so I no longer have an EM12c environment available for testing. But I think I have a good idea of the source of this problem. Before proceeding please make sure that you have already purchased a license for the Database Diagnostics Pack and Database Tuning Pack for at least one of the databases you are monitoring through EM12c, I don’t want to encourage anyone to violate their licensing agreements. You will need to have access to the SYSMAN super administrator account for your EM12c system (or another user with super administrator permissions). 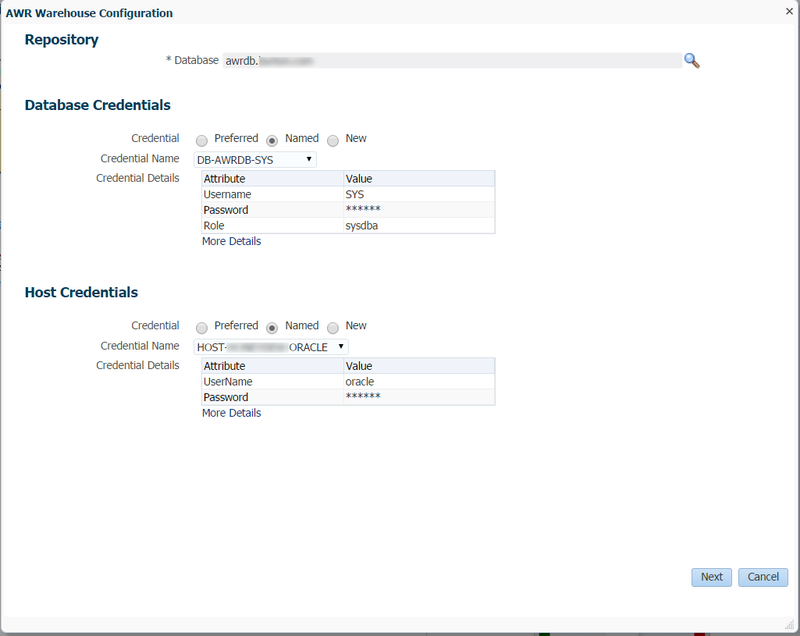 Login to EM12c as a super administrator, then go to the Setup menu and select “Management Packs” -> “Management Pack Access”. On this screen you should see a list of all databases known to your EM12c system. Please make sure that BOTH the database you intend to use as the AWR Warehouse and the source database(s) from which you intend to collect AWR data have the checkbox checked under “Database Diagnostics Pack” and “Database Tuning Pack” for their rows in the table listed. You may need to select the “Licensable targets” radio button and the “Target Based” radio button to see the correct list. 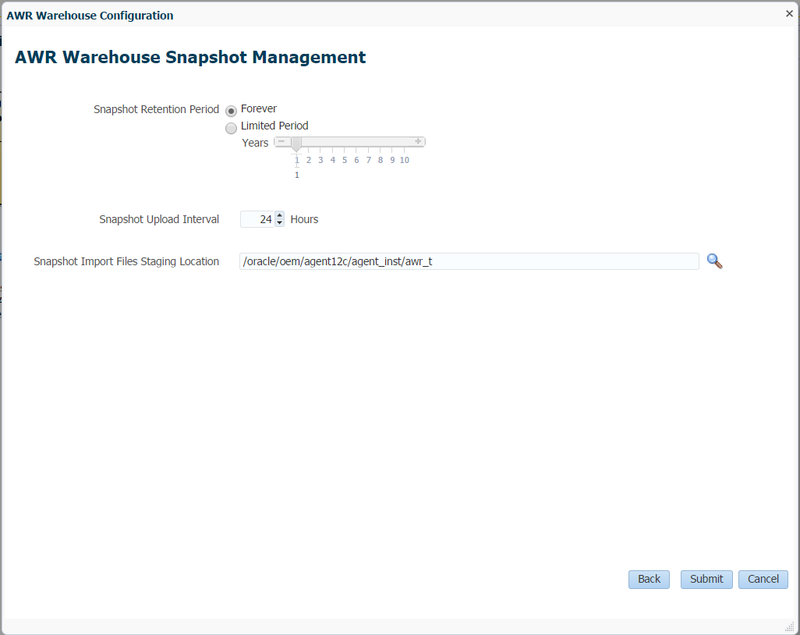 So to make the long story a little shorter: in addition to setting the “control_management_pack_access” startup parameter to “DIAGNOSTIC+TUNING”, you also have to tell EM12c, through the Management Pack Access screen, that those specific targets (and your AWR Warehouse target) should be enabled for OEM functionality that relies on the diag/tuning packs. Once those steps are done I believe that you can continue with the AWR Warehouse setup as I described. 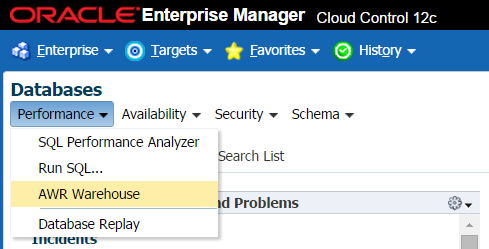 I generally make sure the correct settings are in the Management Pack Access page immediately after adding a new database, so I forgot to mention in this blog post to make those changes before attempting to proceed. Thanks for catching that! I hope this will allow you to continue with AWRW, I think that it will. Reblogged this on Oracle DBA Attempted Zen. EMDB-00769: Enabling Snapshot Upload failed for following targets: PAPA. This can be because of following reasons: 1. Host or Database credentials are not set, or could not be authenticated; 2. The DB User specified in Database credentials does not have DBA Privileges or 3. The Database is down, or the agent is unreachable Please see the log files for more information. I already tested host and db credentials in the Preferred and Named Credentials and they are working fine. I think I am missing something. Please help. Thanks! I have not seen this issue before. I just tested disabling snapshot upload, then enabling it for one of the AWR warehouse DBs on my fully patched EM13cR2 installation and it succeeded without any problems. Do you know that this source database was successfully uploading to the AWR warehouse before you disabled the snapshot upload? If it was broken and not fully added to the AWRW, that could cause failures trying to enable snapshots again. I can think of a few other things to check, but you may have to file a service request for this issue: when you view the AWR warehouse page and see the list of databases uploading snapshots, are you using the same EM13c administrator account that is listed as the DB’s “owner” to do the disable/enable snapshot steps? I noticed that even if I use SYSMAN, I cannot disable/enable snapshots for a database configured by my regular EM admin account. Is it possible that your AWR warehouse database itself is down or inaccessible? I have had strange errors when my AWR warehouse DB got stuck with an archiver error due to running out of space for archived logs. Is it possible that the DB user credentials either for the AWR warehouse DB or the database from which you collect AWR data might have a soft password expiration in the password grace period and needs a password reset? Does any error information appear in the OMS or agent logs? I would also check the job activity page to see if you might have any AWR warehouse related jobs that are stuck or suspended or sitting in problem status. Also I suggest checking the saved/preferred credentials set for the EM admin user you’re using for agent targets on the OMS, AWR repository DB, and AWR source DB, just in case those might be an issue. There is also always a chance that the latest plugin/agent/OMS PSUs and bundle patches resolve this issue but I haven’t noticed anything that looks relevant in the bugs fixed lists. Thank you for your prompt and very detailed reply. I will check on your recommendations and will let you know asap. I have the same issue: EMDB-00769: Enabling Snapshot Upload. Does anyone solve the issue.